U of T alum Steffanie Strathdee’s new book “The Perfect Predator: A Scientist’s Race to Save Her Husband from a Deadly Superbug: A Memoir” recounts her husband’s fight against an antibiotic-resistant superbug. She will share her story at DLSPH on March 26. “First, I was embarrassed because I’m an infectious disease epidemiologist. 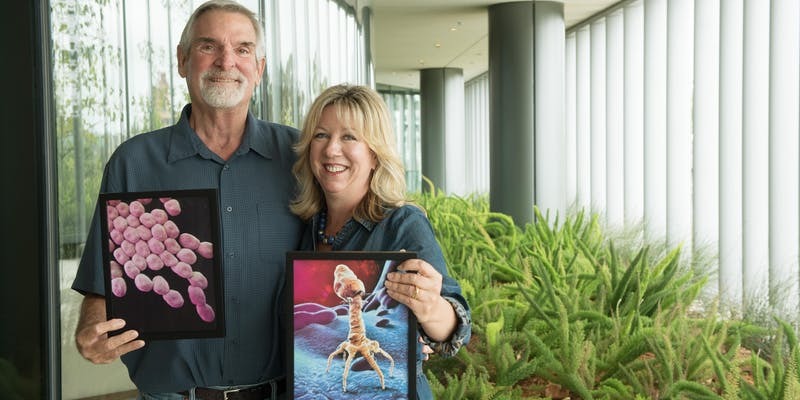 My husband was dying from a superbug infection, and it caught me off guard because this was bacteria that I used to plate on Petri dishes when I studied microbiology at U of T,” said Steffanie Strathdee. Strathdee’s blood runs true blue. She earned all of her degrees from U of T, including her Masters and PhD in Epidemiology from DLSPH in 1994, which was then known as the School of Community Health. She is currently an Associate Dean of Global Health Sciences at UC San Diego School of Medicine. Following a trip to Egypt in November 2015, Strathdee’s husband Tom Patterson fell ill. The couple initially thought it was food poisoning, but Egyptian doctors diagnosed him with pancreatitis. When his symptoms worsened, he was flown to Frankfurt, Germany where doctors discovered that he had an abdominal abscess from a gallstone obstruction which was infected with Acinetobacter baumannii, an antibiotic-resistant superbug that tops the World Health Organization’s list of the deadliest superbugs. This bacterium, as Strathdee describes it, is good at stealing antibiotic-resistant genes and can live under extreme conditions. A few weeks later, he was med-evacuated from Frankfurt to a hospital at UC San Diego where the couple currently resides. Her husband’s condition rapidly deteriorated as the superbug colonized his body. He went into septic shock and remained in a coma for two months. “When students are sitting in their classroom, eyes glazing over because it’s a boring lecture, just remember that a little piece of information can come back later and help you save somebody’s life. That’s what happened in our case,” said Strathdee. As her husband fought for his life, Strathdee did research on the internet and stumbled upon phage therapy, a treatment she had learned from her undergraduate studies at U of T. Phage therapy stems from bacteriophages, which are viruses harvested from soil, dirty water and human waste that specifically prey on bacteria. French Canadian Scientist Félix D’Herelle discovered bacteriophages in 1917 and first used phage therapy to successfully treat humans in 1919. Phage therapy lost its popularity in the 1940s following the introduction of penicillin, but was taken up by the Soviet Union. In an anti-Soviet move, Western experts shunned away from it — until now. Strathdee emailed phage researchers all over the country, and discovered two teams at The Center for Phase Technology at Texas A&M University and the U.S. Navy Medical Research Center that agreed to help. Both teams identified several phages that were active against Patterson’s bacterial isolate, and purified them in time for the medical team at UC San Diego to administer them to Patterson. Since phage therapy remains experimental in North America and Western Europe, the FDA granted permission for it to be used to treat Patterson on a compassionate basis. It was a huge gamble, but it paid off. Three days after beginning intravenous phage therapy, Patterson woke up from a deep coma and began recovering. “My training in epidemiology helped me a lot. It helped me dissect the problem I was facing and then conduct research to seek potential avenues to treat Tom. But it took a global village to achieve our miracle,” said Strathdee. Phage therapy is now considered as a potential treatment for the superbug crisis in North America, following the publicity the case received. In light of their success, Strathdee and colleagues at UC San Diego have opened the first phage therapy centre in North America at UC San Diego, called the Center for Innovative Phage Applications and Therapeutics. They have successfully treated several other patients suffering from superbug infections in the US and abroad, and will launch two clinical trials of phage therapy in 2019. Patterson and Strathdee shared their experience in, The Perfect Predator: A Scientist’s Race to Save Her Husband from a Deadly Superbug: A Memoir, a book she hopes will help others understand the growing threat of superbugs and the potential cure on the horizon. Patterson and Strathdee will be sharing their story and selling copies of the book at DLSPH on March 26, 2019 at noon in the 7th floor lounge in the Health Sciences Building.